These Shrubs Work In The South, And They’ll Work For You Too! 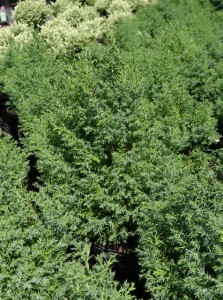 Fall is the perfect time for planting shrubs, either in your landscape or in containers, and we have a new shipment of locally grown plants that will do well for you whatever your needs. Since our nursery is small, we have to be very selective in the shrubbery we offer and only carry those that work for us in the Birmingham and surrounding areas. The nursery these come from is located right down the road in Shelby County, so you’re keeping your money here in Alabama! First, know the amount of light the area will receive. Hot, direct sun for four or more hours per day is, of course, considered full sun. Many of our homes, though, have mature trees or are shaded by buildings; so watch the amount of sun and monitor it as it moves through your landscape at different times of the year. Determine the purpose for your shrubs. Do you need them to hide an unsightly fence or to soften a building or wall? 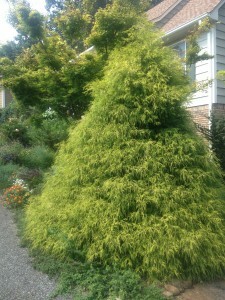 Perhaps you are looking for one interesting evergreen to anchor a flower bed or to put on either side of a walk. Some shrubs have interesting bark or berries, while others have beautiful foliage all year. Determine the ultimate and maintainable size you need your shrub to be. No one wants to have to continually prune a shrub that has grown too large for its spot. Make wise choices from the beginning and this won’t happen. If you’re designing large containers, evergreen shrubs mixed with seasonal flowers and pretty trailing plants can beautify any area and can also serve as wonderful focal points in your garden. 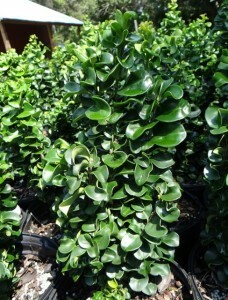 The ligustrum japonicum ‘Coriaceum’ is one that will take full sun to partial shade and could be wonderful in a container, growing to 4′ with a spread of about 2′. 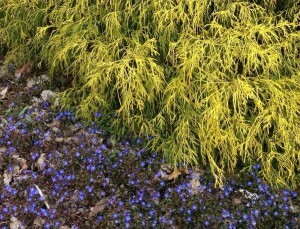 golden chamaecyparis foliage, with a skirt of Veronica ‘Georgia Blue’, shines in the spring…. 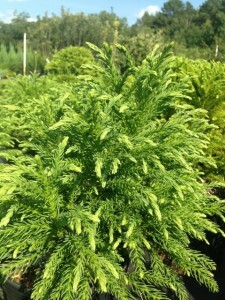 Other shrubs that are available now include several chamaecyparis obtusis selections. These are grown for their beautiful foliage and tolerance of full sun and hot, humid summers. 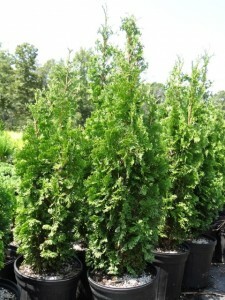 New selections of junipers, cryptomeria, Thuja and hollies have also arrived, just in time for fall planting. Many are also beautiful as cut greens for holiday arrangements or as fillers in floral designs also – double duty shrubs are the best! An ornamental blueberry, Vaccinium darowii ‘Rosa’s Blush’, is a smart choice as a woody plant for a partially shady spot. The small deciduous shrub’s new growth is a pretty purply color, and the texture in the landscape is very soft. Don’t let this fall slip by without stopping in to take a look at some of these interesting and useful woody ornamental options for your landscape or planters – you won’t be sorry! This entry was posted in Planting Tips, Tree/Shrubs and tagged chamaecyparis, cryptomeria, ilex, juniper, ligustrum, thuja on September 14, 2013 by Kris Blevons.